A friend of mine (Mary) asked me to write her a list of 10 things to know before you go to Korea. I've decided to put it here for anyone else thinking of visiting Korea as a tourist. Please bear in mind these are merely my observations, as a white, female Briton. 2. Things are far away from each other in Seoul. The subway is excellent, especially the airport express. But just be aware your journey will take a long old time! 3. Buy a t-money card (same as oyster). You will save time and money. You can use it on the subway, bus and airport express. 4. There are A LOT of Americans here. Everyone will assume you are American. Many people here are incredibly ignorant about anything not relating to the US. To them; you are white and therefore American. People speak American English and have a hard time understanding some British (or Australian/NZ/South African) pronunciation. Esp: can't, dance, castle. 5. No one can differentiate between England and the UK. I feel for any Brits from Wales or Scotland. The only place they know in the UK is Manchester Utd. A typical conversation with a Korean will go thus: Korean: "Where are you prom? Amelica?" Me: "No I'm from the UK, Yong Guk" Korean: 'Ahh Manchester United!!! 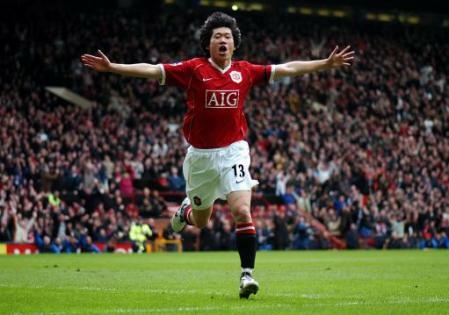 Park Ji Sung, YOU KNOW?!! Bery good soccer player". If you don't know who he is, you will soon. 6. There are hundreds and hundreds of coffee shops; starbucks, coffee bean, cafe bene, angel-in-us, hollys coffee. Koreans like to visit them often to socialise. Therefore they are usually quite busy, and the coffee there is exorbitantly priced. 7. You are white. You will be stared at. You will be stared at more if you wear sleeveless, strappy or 'low cut' (anything below your neck) tops. But as it is boiling hot I suggest just getting over the stares to avoid overheating. 8. DO NOT sit on the last 3 seat at either end of each subway carriage. These are STRICTLY reserved for the elderly or disabled. 9. Don't cross your legs on the subway, or indeed anywhere else in front of a Korean. It is considered rude. Blowing your nose in public is also considered rude and disgusting (sniffing is not though). 10. Koreans are terrible drivers. They drive in the same way they walk down the road, without looking or considering anyone else. Crossing the road becomes a game of chicken. That car is hurtling towards you, but if you don't walk out staring straight ahead, you will be waiting forever on the pavement (buses are the exception, you WILL get run over by a bus). Most Korean cars are automatic and no one has any control over speed, so you will (bus or taxi) travel down the road jerking along while the driver quickly alternates between the accelerator and the brake. If you have a hangover, I suggest you walk wherever you want to go. Also, on the bus especially, hold on for dear life, the bus driver will approach the bus stop at the highest speed possible before slamming on the brake, just in time. 11. One for luck; Traditional culture dictates these last 2. As a foreigner no one will be offended if you don't, but if you want to fit in more: Always give things with 2 hands, money, drinks etc. Bow to people when you greet them. At times you feel like a nodding dog, and if you stay here long enough it becomes quite natural and you will do it when you go home too.